In advance of the president's speech to the nation this evening about the government's and BP's response to the catastrophic oil spill in the Gulf of Mexico, White House press secretary Robert Gibbs confirmed that, one way or another, BP will no longer be directly responsible for processing claims from those affected by the disaster. When asked on CBS' "The Early Show" this morning on how President Obama can prevail upon BP to expedite or streamline the process for Gulf Coast businesses and residents, Gibbs said, "The best way to prevail on BP is to take the claims process away from BP. "The president possesses the legal authority and will use it to make this claims process independent, to take it away from BP, and to ensure that those who have been harmed economically have their claims processed quickly, efficiently, transparently, and that they're made whole again for the disaster caused by BP," Gibbs said. "So that's going to happen?" asked anchor Harry Smith. "That will happen," Gibbs replied. 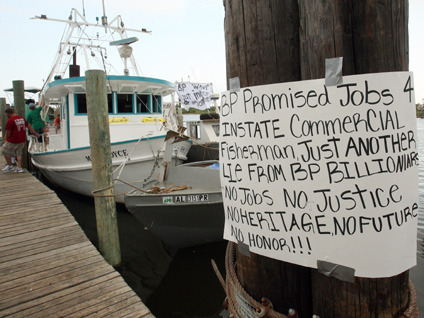 "The president will either legally compel them or come to an agreement with BP to get out of the claims process [and] give that to an independent entity, so that the people that have been damaged can get the money that they deserve quickly." Mr. Obama is on the second day of his fourth trip to the Gulf. Yesterday he met with local businessmen in Gulfport, Miss., and toured an Alabama facility where workers clean dirty boom. On Tuesday he will visit beaches damaged by oil in Pensacola, Fla. Acknowledging the anger and frustration among those in the region, Mr. Obama said promised yesterday that "things are going to return to normal." Gibbs rejected a suggestion that the federal government has not been doing enough, or has superseded local and state officials in their response efforts. He also rejected criticism from Florida Senator Bill Nelson, who said last week, ""The decisions are not timely. The resources are not produced, and as a result, you have a big mess, with no command and control." "I'm not necessarily sure I would agree with Senator Nelson on the exact sentiments of his statement," Gibbs said, responding that Coast Guard personnel are matched up with county and parish officials all along the Gulf Coast. "From my experience down there, it may sound like it from where you are, but from [what] we have heard on the other end, it sure doesn't feel like it," said Smith. "Harry, I understand. I've been to the Gulf, too. I've talked to those local officials. We've spent time with mayors and parish officials and county folks. In many ways we're implementing state and local response plans," Gibbs said. "Nobody's going to look back and say that this was a perfect response. But there's no doubt that we are each and every day depending on state and local officials for exactly that: placing the boom, operating the skimmers. A lot of the skimmers right now are fishing boats that can't fish and can't make their livelihood out of that, that are helping in the response. And we're helping to clean up the beaches, too, and ensure that if oil does wash up on those beaches, that it's cleaned up quickly and we can deal with it. On Tuesday night the president will speak to the nation from the Oval Office. Gibbs said the president will discuss what's next in dealing with the largest environmental disaster in our country's history. "The president understands the challenges, and tonight will outline a plan moving forward to deal with the oil that's leaked, to respond to those that have been damaged economically as part of this in the claims process, what has to happen going forward to make sure that something like this never happens again, and to discuss with the American people our approach towards reducing our dependence on oil and other fossil fuels." President Obama's address to the nation can be watched Tuesday night at 8:00 p.m. Eastern on CBS Television and online at CBSNews.com.